What’s Going On With Jet Airways After Mass Cancellations, Partial Fleet Grounding & Axing Of Routes? As we recently wrote the situation is dire for Jet Airways as financial troubles have the airline – which was once known as India’s premier carrier – hanging by a thread. Lenders of the stricken airline are currently discussing options ranging from emergency loans to auctioning the carrier off to the highest bidder (if there is any). What’s currently going on with Jet Airways is indeed a sad picture and situation. Not too long ago the company was seen as a great alternative to the dismal conditions at national flag carrier Air India but in the end Jet couldn’t keep up with the pressures of the aviation industry in a low yield market. Two weeks ago John wrote about Jet Airways owing salaries to their employees and having grounded half of their fleet. Since then a lot of things happened and unfortunately not for the better. As a result of the fleet grounding obviously many routes were cancelled and this is now starting to affect travelers in a negative way. CNCB had a very informative piece yesterday written by Ajay Awtaney who runs Live From A Lounge. It’s about cancelled routes and what Jet Airways did so far. Till a few days ago, Jet Airways was accommodating displaced passengers, those whose flights were cancelled, on the flights of their peers such as Air India and Vistara. However, for various reasons, Vistara and Air India have stopped accepting the displaced passengers of Jet Airways at the moment, which means, if the airline is not able to get passengers a replacement ticket on their own plane, they are now issuing refunds to the passengers. For instance, flights from Abu Dhabi to Mumbai were cancelled overnight. 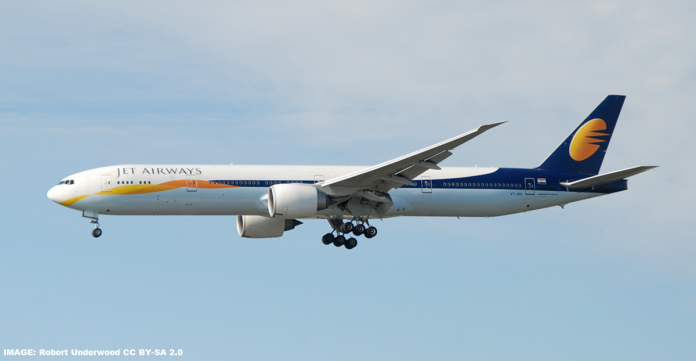 However, Jet Airways would still be able to accommodate those passengers on their Dubai to Mumbai flight schedule. And just as an example, if a flight between Delhi and London is cancelled, they can also put passengers on their partner airline Virgin Atlantic. … if you are booked for Delhi-Hong Kong on Jet Airways which is now cancelled, Jet Airways could book you on Hong Kong Airlines to bring you to Bangkok and then take you on a Jet Airways plane from there to Delhi. Jet Airways also has 5 Boeing 737-800 Max aircraft that are currently grounded based on technical / safety review restrictions. The airline is apparently about a billion USD in the red. It seems that there are no eager parties to put up the capital to refinance and recapitalize the airline that is 24% owned by Etihad. Earlier last week the lending consortium that owns Jet Airways loans openly considered auctioning the airline off. Today the Times of India reported that lenders have green-lighted emergency loans and also realized that creditors might need to take a haircut on the due loans of Jet Airways. Minority lenders that are part of the consortium that has lent to Jet Airways have agreed to grant priority status to Jet Airways have agreed to grant priority status to funding that would be provided by State Bank of India (SBI) and Punjab National Bank (PNB). This will provide SBI and PNB to provide emergency funding to keep the airline afloat until a resolution plan is in place.Priority status for the loans would mean that if at the time of resolution lenders need to take a haircut on their historical exposure, the emergency funding would not be subject to any deductions. Another real problem is the outstanding salaries. Employees need to get paid or there will be operational problems down the line. Nobody is able to work for free for an extended period of time, especially when the future of the employer is uncertain. If employees start to desert Jet Airways or go on strike the airline is toast. The same goes for reputational damage that keeps passengers from booking new tickets on the carrier. It just enlarges the financial problem and when the solvency of the carrier is in doubt fuel companies and airports worldwide will insist on advance or cash payments for their goods and services. In fact this has already started as Jet Airways passengers (all, even Business Class) have lost their ability to use the Plaza Premium lounge in Delhi and Hyderabad. Effective Mar 18, 2019 lounge access to the Plaza Premium lounge at Delhi Airport, Terminal 3 and Hyderabad International Airport will be unavailable for Première guests travelling on Jet Airways domestic and international flights. We regret the inconvenience. No doubt that is because Jet Airways can’t pay Plaza Premium anymore at the moment (and possibly owes them money for customers who visited in the past). It’s probably a safe bet at the moment to avoid booking tickets on Jet Airways and constantly check existing tickets to see if any of the cancellations affect your trip. If so contact Jet Airways immediately to negotiate options. If you have already booked Jet Airways tickets I’d also make sure that the travel insurance has sufficient coverage for a possible grounding/last minute cancellation. Previous articleGiveaway For 100,000 Marriott Bonvoy Points! Enter By 11:59PM EDT On Friday March 29, 2019!